The concept of “thinking outside of the box” is not new. But as we all know, it’s easier said than done. We love our industry. It’s filled with challenges that push us to think differently, obstacles that test our conviction – and triumphs that affirm our efforts. Every building that rises into the skyline is a testament to the spirit of progress. With that said, we’ve been thinking a lot about what it takes to overcome the challenges we consistently face in the world of construction: schedule conflicts, aggressive timelines, complications related to the job site and the jigsaw of coordinating with the many teams and trades involved in a project. Because we are always pursuing new ways to best serve our clients, we’re always working to identify the keys that can unlock the gridlock that can plague projects. Experience is the best teacher in many cases, and our recent contribution to the Miami Valley Hospital South Tower Addition challenged us to think outside of the box – or outside of the frame, in this case – to get the job done and learn a thing or two in the process. The project presented an aggressive schedule, and the steel contractor had to top out the building before erecting the framework that would connect the tower addition to the main building. Due to an imminent controlled air milestone, the piping had to be installed ahead of the framework. But as you may know, at TP Mechanical we’re not going to let the lack of a steel frame, a tight timeline, or the added adventure of an uneven SOG box us in. Collaboration, imagination and invention were the essential components of our attack strategy. 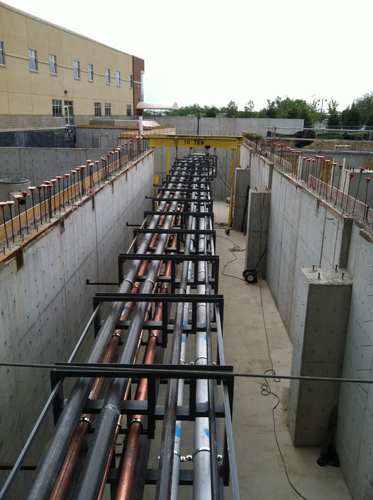 Our in-house contracting and fabrication teams worked together to engineer an innovative stand-alone rack system that would allow us to place the pipes into final position and handle the connection to the steel at a later date. The fabrication shop pre-fabricated the racks in-house and constructed roof supports to hold the rooftop piping. The racks were transported to the site and rigged in the air using a 16-foot, 10-ton Gantry Crane System, while our crew welded the support posts from below. We tackled the uneven SOG by field-cutting the support posts at different lengths to keep the racks level. The racks were in final position in just two weeks. In the end, this experience reinforced something we already knew – teamwork is the key to meeting project challenges and delivering innovation.